This is a great strategy game in which you are the holder of an ancient treasure. There are many that wish to steal your gems but you can defend it as the enemies can only approach your hide-out on a certain, predictable path. The goal is to keep them from getting away with any of the gems, and the way you will do this is by building lots of archery towers, crypts and other defensive buildings to help you kill the thieves. They cost money though, but you will get some as reward for each of your kills. There are multiple types of land and certain buildings need certain land tiles so they can be build. 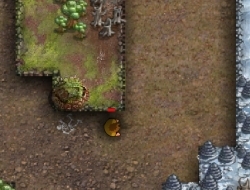 You can make more of the desired tiles by cutting the trees down or smashing the rocks. Keep your jewels safe from the thieves at all costs. Use the mouse to prepare the terrain and build your towers. Cursed Treasure 0.00 between 0 and 10 based on 0 votes.